The size of Donald Trump's hands has been a bit of a joke on the campaign trail lately. But on Thursday night, Trump took it to another level. At the Republican debate in Detroit, the presidential front-runner defended his hand size, which was first mocked in a satirical magazine in 1988 and then brought up last week by Sen. Marco Rubio. 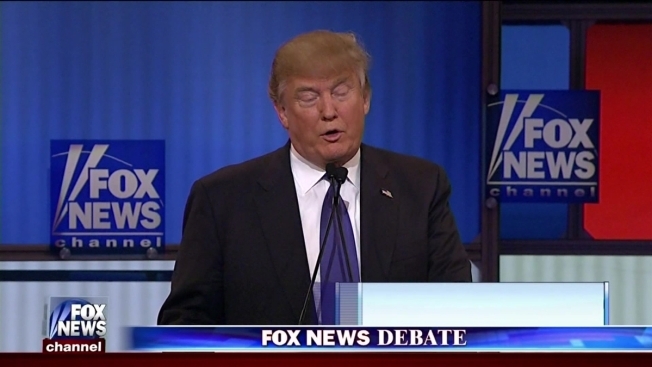 Trump viewed Rubio's comments as an insult about Trump's sexual prowess. Trump referred to Rubio's jibe with a crude sexual reference of his own. Holding his hands up for the audience to see, Trump said: "He referred to my hands – if they're small, something else must be small. I guarantee you, there's no problem. I guarantee you." Instantly, Twitter lit up with reactions from people across the political spectrum. Republican commentator Michelle Malkin seemed to throw up her hands at the spectacle, saying "Heckuva job, everyone," while former Barack Obama adviser David Axelrod joked about Trump's hidden assets, referring to his as-yet-unreleased tax returns. Holy... Trump defends his, um, manhood. "Look at those hands... I guarantee you there's no problem. I guarantee you." Trump is currently showing off the size of his hands. Yes, this is happening. Trump defending his hands LOL! This is the shallowest start to any debate I can think of in some time. Trump also claimed Thursday that he had never heard the joke about the size of his hands, which dates at least as far back as Spy magazine calling Trump a "short-fingered vulgarian." The writer who made the remark, Graydon Carter, is now the editor of Vanity Fair magazine, and he wrote in November in his magazine that he still periodically gets letters from Trump in which the billionaire has circled images of his hands in gold Sharpie and written, "See, not so short!" For the record, a Washington Post examination this week found Trump's fingers are average size.